Treat your pet to a respite of comfort and tranquility. A gentle coconut-derived cleanser with just the right combination of plant extracts and essential oils to leave the hair shiny, unbelievably manageable, and brilliantly clean. Oatmeal to soothe the skin, lavender to clam the soul, and nourishing to your pets skin and coat. Use regularly to keep your pet clean and comfortable. Environmentally safe, cruelty free formula. If you enjoy the luxuries of a day spa, your pet will love the skin treatments offered by our Spa collection. Our scientists have combined plant elements with natural science to create therapies to enhance your pets well being. 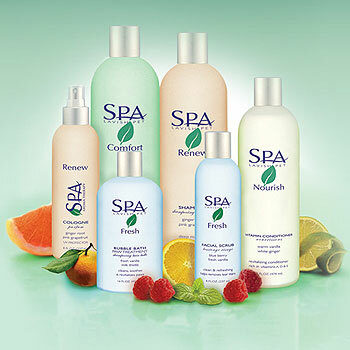 We deliver only the most innovative, natural body and bath products available.